Here's a brief description of how to use the catalog to find a book from a 1922 guide to the library. 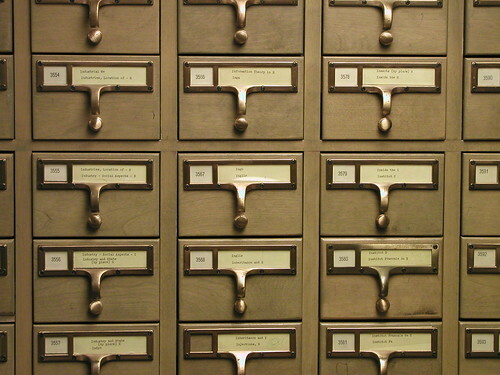 The catalog is a record of all the books in the Library. It is kept on cards which are arranged in one alphabet in the catalog cases. There are three ways to look up a book in this catalog: (a) under the author's name, (b) under the title of the book, (c) under the subject of the book. The headings on the subject cards are red. 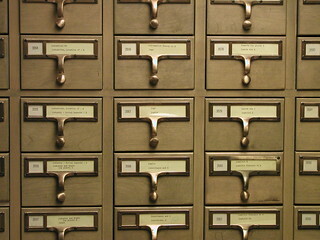 A catalog card contains the author's name, the title of the book, and the call number, besides other bibliographical data. The call number locates the book on the shelf, and is found in the upper left hand corner of the card. The small cards in the catalog are remnants of the old library catalog. On these small cards the call number is found only on author cards. A name stamped over the call number indicates the particular place on the campus where the book is located, as ENG. LIB., meaning the Engineering Library; or GRAD. R.R. 1, indicating that the book is in Graduate Reading Room Number One. Information for Readers. [Ann Arbor], 1922.